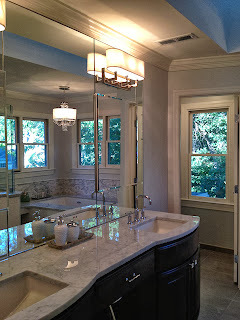 Eileen Naughton, ALA Certified Lighting Specialist in our Chantilly Showroom shared a master bath project with me for the blog. She worked with Kim Casson, Salmon Casson Ltd. Interior Design. The home will be featured on the 2013 Reston Home tour. Two fabulous fixtures are featured in the Master bath. A Crystorama chandelier (9804CH) and sconces from Hudson Valley (Grayson Wall Sconces). 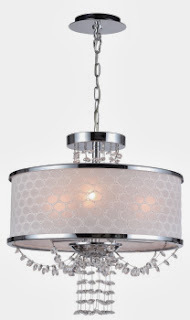 The Polished Chrome convertible Chandelier is from the Crystorama Allure Collection and features a unique draping of crystal and a drum shade. Custom oval shades balance the angular features of the sconces from Hudson Valley Lighting. 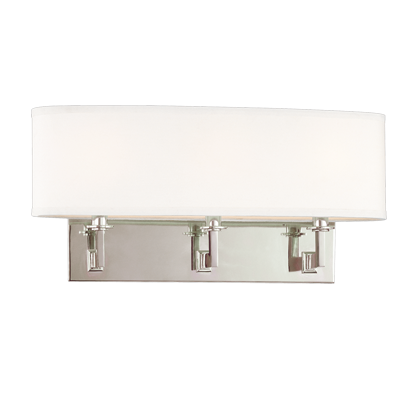 A flat backplate anchors the sconce’s square arm bracket. The 12th Annual Reston Home Tour will feature five extraordinary private homes open to the public for a self-conducted tour of the unique interior design and architecture in the neighborhoods of Reston.